The XKSS sports car. When, in 1956, Jaguar cars withdrew from international sports car racing, the company was left with 25 unsold single seater Jaguar D-Types from the 68 units that had been built. 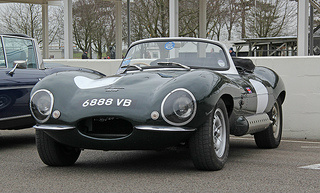 Although it was regarded as an icon by winning Le Mans three times, Jaguar still had difficulty in selling the car. This wasn't helped by the fact that race car development was evolving ceaselessly and, as such, there was little chance that these 25 units would find a buyer. 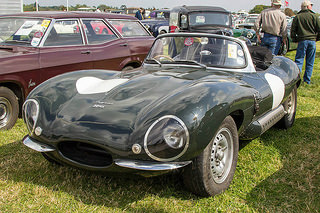 Then, by chance, it was suggested that the solution was to convert them into a road going version of the D-Type Jaguar sports car aimed at the North American market exclusively. 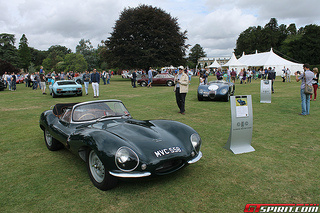 The resultant car was designated the Jaguar Super Sports, or more simply, the XKSS. The conversion turned out to be very easy, and the prototype chassis XKSS701 was quickly assembled. The final car was, essentially, a D-Type with components both added and removed. It was powered by the 3.4 litre XK engine that developed 260 bhp, with a compression ratio of 9.0:1, and fitted with three Weber twin choke carburettors. It used a four speed gearbox and 12.75 inch Dunlop disc brakes all round. In reality, it was a race car designed for the street, and priced at $6,900. In February 1957, only three weeks after production had started, a fire broke out, after the close, which seriously damaged the assembly line. As a result, a number of incomplete chassis and numerous parts were destroyed but, more importantly, most of the jigs and tooling were lost. In fact, 9 of the 25 cars that had already been completed, or partly completed, were destroyed. This was, in fact, the death knell of the XKSS and, by the end of 1957, only 16 units had been built, and all were sold, with the majority remaining in the US, although two went to Canada and one to Hong Kong. The XKSS was susceptible to wheel spin since it was not fitted with limited slip differential. When road tested, its top speed was 144 mph since, at that speed, it went into the red at 5800 rpm. It had a 0-60 mph time of 5.2 secs, and a standing 1/4 mile time of 14.1 secs. With the exhaust positioned on the left, the passenger felt the full impact of its heat through the aluminium cockpit. Since the engine had no specific flywheel but was fitted with racing camshafts from the D-Type, it responded immediately to the throttle, whilst the power was centred in the top third of the rev band. The redesigned XKSS chassis had a tendency to flex, since the central cockpit brace had been removed. Also, since the generator only began charging beyond 2000 rpm, extended urban driving ran the risk of running the battery down. The most high profile XKSS Jaguar sports owner was the film actor Steve McQueen, whose car XKSS713 was a regular sight around Los Angeles. Having chosen British Racing Green, he nicknamed it the "Green Rat". Of all Jaguar cars, this was an unquestionable classic. 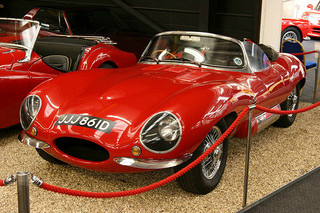 A 1957 replica Jaguar XKSS in showroom condition would command between £140,000/$220,000 and £190,000/$300,000, whilst a completely restored original example in mint condition was sold at auction in the US for $1.925 million.